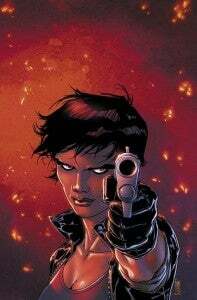 In a marketplace full of white guys, DC Comics announced today that Amanda Waller will become one of the handful of women of color to have her name in the title of a Big Two comic in March when the Suicide Squad: Amanda Waller one-shot hits from the creative team of Jim Zub and Andre Coelho. The character, a fan-favorite who has appeared in other media including Justice League Unlimited, Arrow and the Green Lantern movie, has been a bit controversial since the launch of the New 52, when the "classic" Amanda Waller--a heavyset, imposing woman nicknamed "The Wall"--was replaced by a version who looks more or less like every other female in most superhero comics (read: like a supermodel, but with a gun). Now, alienated from the organizations she's been leading for years, Waller will apparently face off against a powerful enemy with an axe to grind--and it'll give Jim Zub, whose run on Birds of Prey was over before it started--an opportunity to take the reins on one of the DC Universe's most significant female characters. You can check out the solicitation text below.